Top Al Qaeda in Iraq Official Captured! US Forces in Iraq announced the capture of the highest ranking Iraqi in the Al Qaeda organization inside Iraq. The U.S. command said Wednesday the highest-ranking Iraqi in the leadership of al-Qaida in Iraq has been arrested, adding that information from him indicates the group’s foreign-based leadership wields considerable influence over the Iraqi chapter. 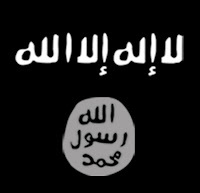 In Web postings, the Islamic State of Iraq has identified its leader as Abu Omar al-Baghdadi, with al-Masri as minister of war. There are no known photos of al-Baghdadi. Bergner said al-Mashhadani had told interrogators that al-Baghdadi is a “fictional role” created by al-Masri and that an actor is used for audio recordings of speeches posted on the Web. Pajamas Media and HotAir have more. 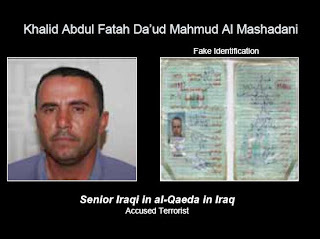 Bill Roggio has more on the Al Qaeda front group and includes this photo released of Al-Mashhadani.